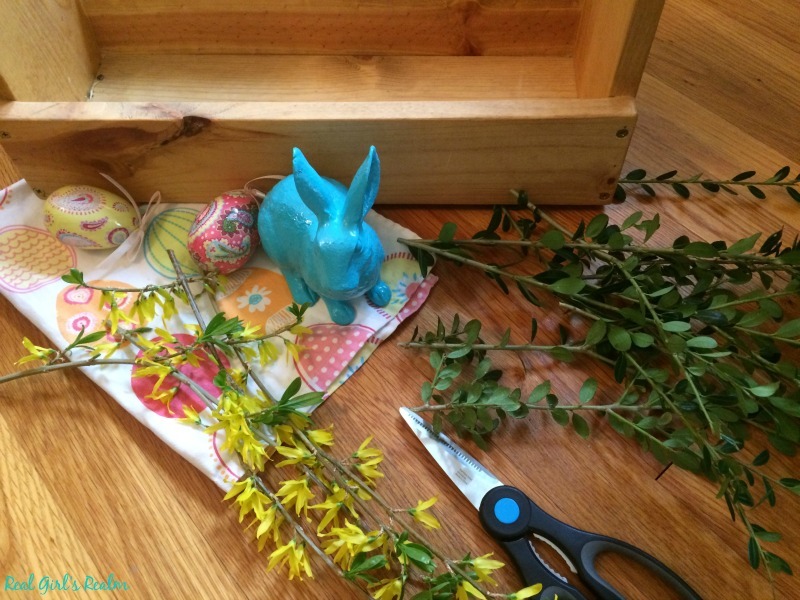 When the Jonquils and Crocuses start blooming, it means it is time to put away the winter decor and break out the pastel colors, birds, and bunnies for Easter! 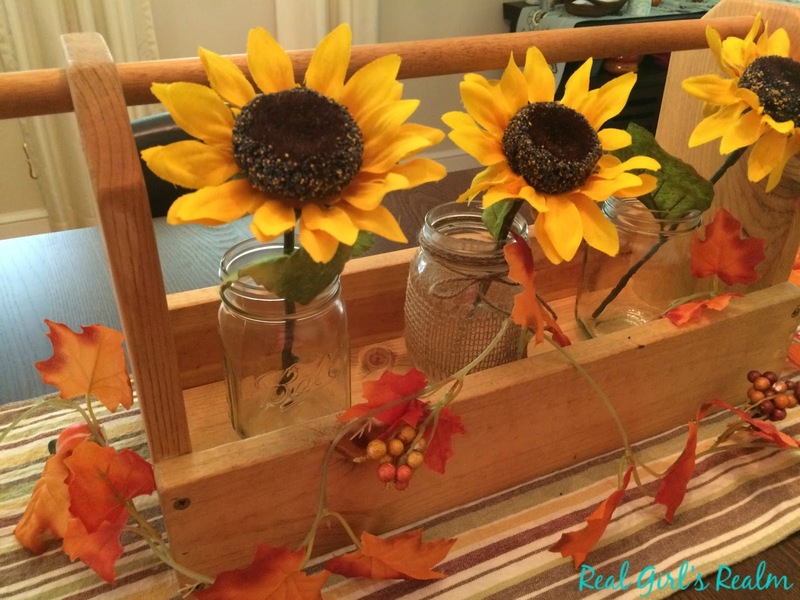 I decided to incorporate my wooden toolbox into my decor after seeing this post on Instagram from Salvasgesista. Decorating does not have to be expensive. I am going to show you how to use Dollar Store finds and items from around the house to create a wooden toolbox centerpiece for your Easter decor. Start with a wooden toolbox, then grab some faux moss from the craft store or greenery from your yard. I cut some clippings off boxwood and forsythia bushes in my yard. Layer them in the bottom of your toolbox. 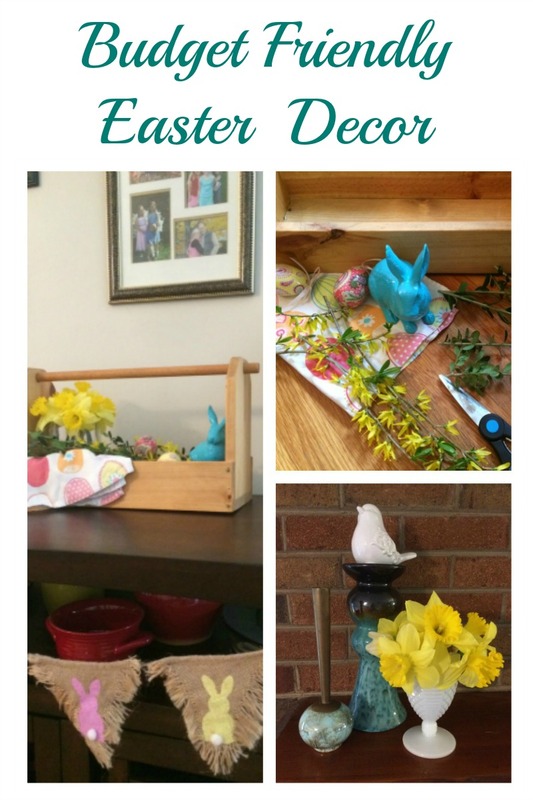 Layer a Easter print hand towel on one corner. The Dollar Tree is a great place to pick up seasonal decor. Add in your Easter themed items, like eggs, a bunny, or birds. 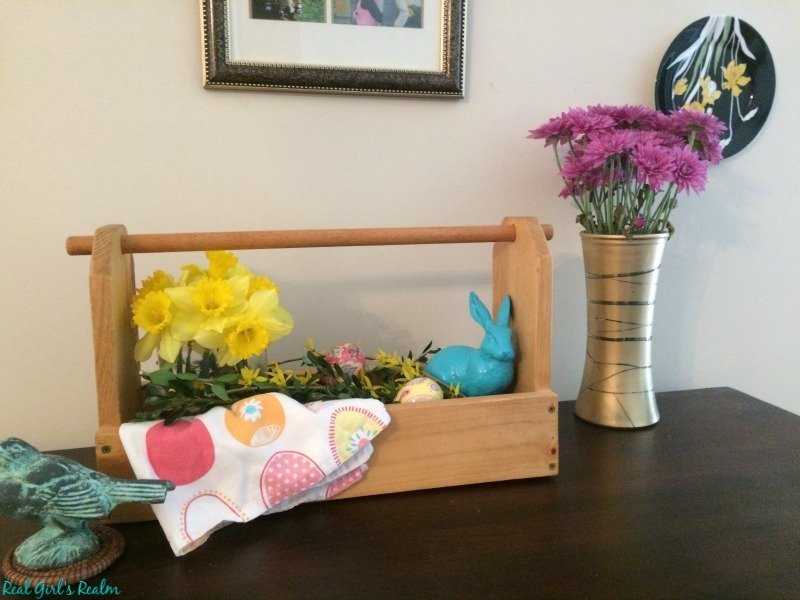 I also added a small vase of Jonquils in the corner for an extra pop of color and placed a Turquoise bunny in the other corner. I found these pretty eggs at TJ Maxx a couple of years ago and they are perfect for Easter. I placed a couple of them in the greenery. 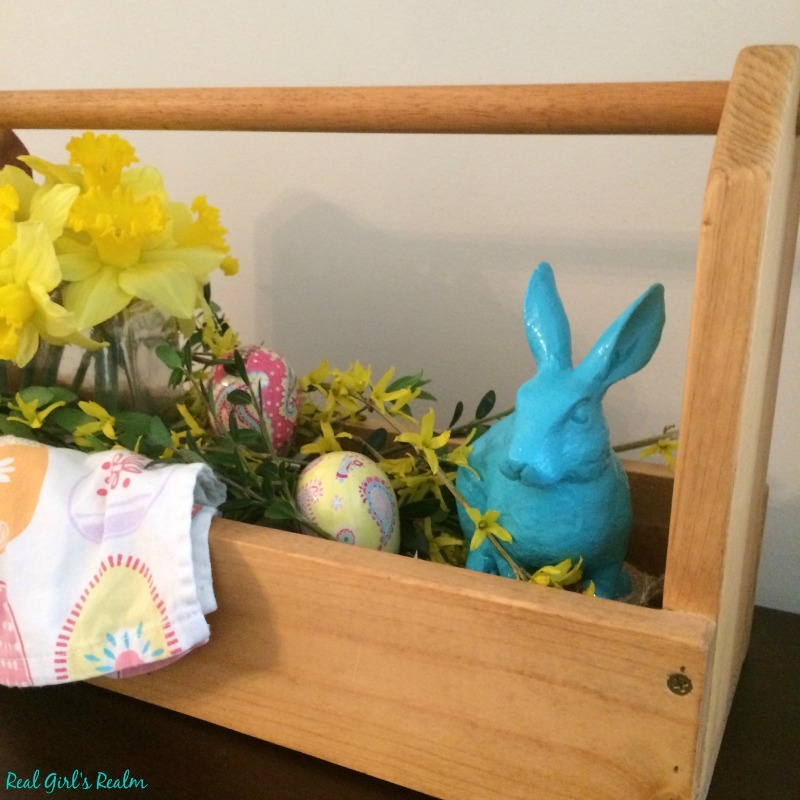 This Easter themed wooden toolbox is the perfect centerpiece for your Dining room Table or buffet. 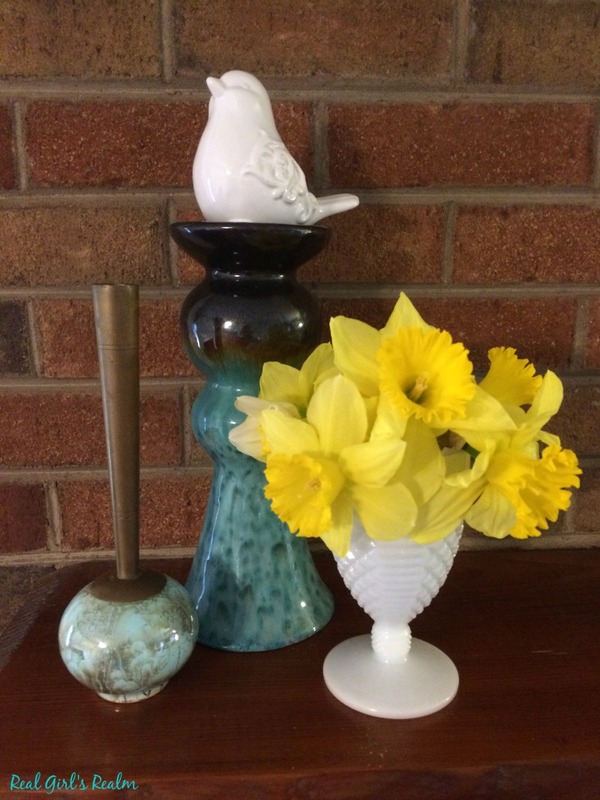 I made it the centerpiece of my buffet decor and added a turquoise bird and gold Geometric painted vase with spring flowers in it on either side. 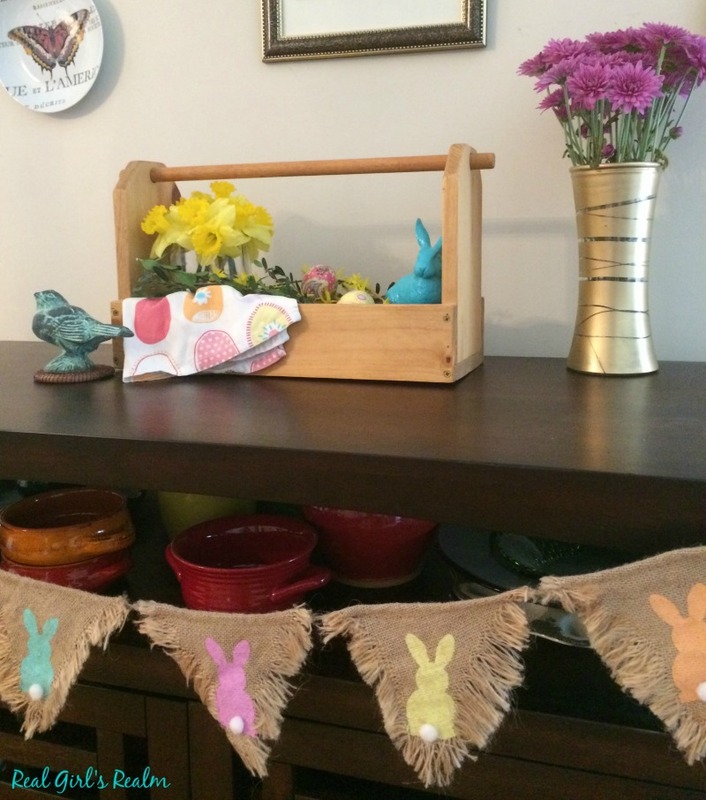 I found the burlap bunny banner at the dollar spot at Target last season. I arranged some of my thrifted glass bottles with small branches in them and hung glittery, foam eggs from the Dollar Tree on them. I used the rest of the eggs to full a mason jar and added an Easter themed candle holder. I also added a few mini, ceramic birds around the bottles. 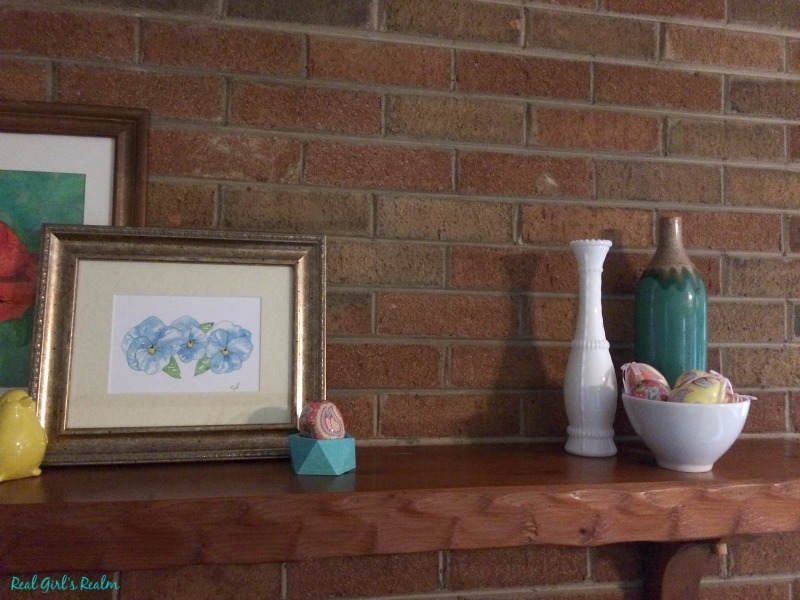 For the mantle, I started with a focal point in the middle of two watercolor prints of flowers that my Mother-in-Law painted. On one side I added a turquoise/brown candlestick with a white bird sitting on top. I also put a cluster of bright daffodils in a milk glass cup and added a funky mid century bud vase. 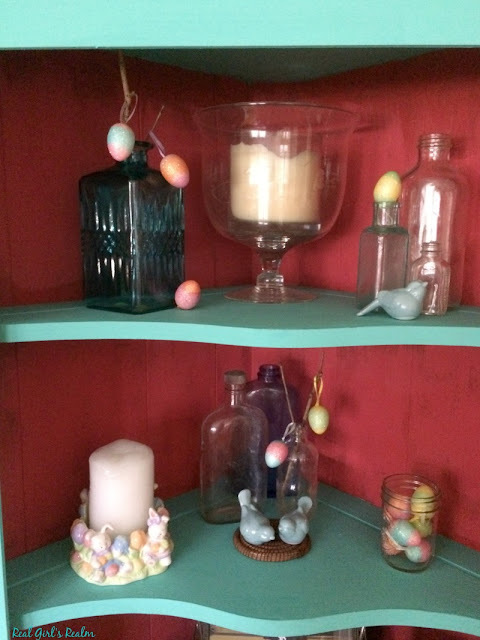 On the other side, I kept the same color scheme with turquoise/brown bottle, white milk glass vase, and white bowl holding colorful Easter eggs. I also added a pop of color around the framed pictures with a yellow bird and turquoise dish, holding an egg. Almost all of my decor was found at thrift stores, Dollar Tree, TJ Maxx, or Target dollar spot. You do not have to spend much money to decorate your home for the holidays. I also keep an eye out for clearance items after the holidays and put them away for the following year. You may also like my Sunflower centerpiece I created using this same toolbox! My son has created stylish wooden items to decorate our home, and he says that he got the ideas by visiting CutTheWood.com and his efforts helped conceptualising those ideas with greater ease.